It seems that social commerce is the buzziest of buzzing buzz trends right now, but very few people are doing it right. So, here’s our top five ways to tell that your social commerce campaign isn’t actually social commerce. 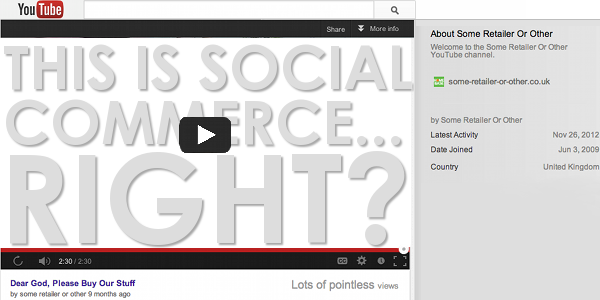 Linking to your bog-standard e-commerce site from a YouTube video isn’t social commerce. It’s social marketing. Stop trying to pretend it’s anything new. These are all social things in and around the world of commerce. And that’s wonderful. But it’s not social commerce. It’s still just social. 3. You’re selling stuff just like usual but… wait for it… you’ve set up a store in Facebook! That’s like calling a ready-meal-for-one a dinner party. Unless people are buying things together, it’s not social commerce. It’s just people buying things. If you’re just hoping your campaign will be shared – even go viral! – then you’re living in 2002. Social commerce means giving people the tools and the incentive to purchase collaboratively with their friends. We’re massive believers in the power of social commerce, but it’s time everyone stopped dilly-dallying around the subject and pretending that what they’re doing – social marketing – is anything more than a step in the right direction. If you want to experience the massive difference REAL social commerce can make, we’re always available for a chat (even at weekends). Paid vs. Earned Media: what’s more important for your marketing strategy?